I opened up an ecoplug module bought from Home Depot. They are currently on clearance for $15 Canadian each (about $12 US). The switches can only be controlled via the app (which is pretty crap) but I have captured and dissected the communication and discovered it is essentially just a UDP packet controlling the switch state. I was considering writing an openHab binding for it; but decided to open up the switch instead. Update: If you want to try this yourself; John has written an excellent write up filling in many of the steps omitted below; definitely worth a look. I confirmed the unpopulated 8 pin part was for an external adc; based on the wiring it looks like the optional power meter monitors voltage; current and power factor of the load. Backside of the power board; lots of depopulated parts which would be used for the optional power monitoring. Are they listed on the Canadian home depot site? ...and where in the store did you find yours? I'm hoping the one here in BC have some left. I got two boxes of 2 each at the Home Depot in Kanata Ontario last week. Nice work! I like your captive portal code but couldn't access it (lib folder) on github page? Home Depot Kanata has 55 of them.. But they are not at eye level... they are way up in the shelves.. I explicitly added the libraries to the github repository; so you don't need to track them down now. Hey Scott I created a hack.io page Detailing various pages from around the web using this module. I am going to link you back to it. Also i wanted to let you know Walmart sells them under a different name too and I do think they also sell the one with the current shunt in them. Thanks Scott! I got a bunch of these on clearance at Home Depot last month. I'm still new to the ESP8266 and trying to learn more about it. Scott, thanks so much for all of the work. 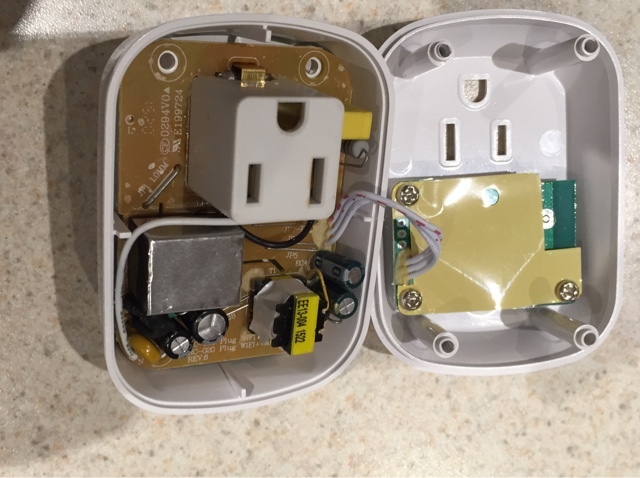 I've implemented your firmware without issue on my ecoplugs. I'm able to connect to the switch via it's IP address and can turn it on and off via /on and /off commands. I'm now looking to integrate the switch into my OpenHAB setup via mqtt. I see that there are fields for server and port details, which I've populated, submitted and get at 'ok' response from the board. If I then refresh the boards webpage, the fields are blank again with the exception of the port field. It's also not clear to me how to define the mqtt topic that the switch would publish/subscribe to to be commanded by OpenHAB or push it's state to OpenHAB. Any guidance would be appreciated as I'm just learning all of this over the past couple weekends. Hwy John; glad you're using it. I'll be pushing an update tonight or tomorrow with mqtt support. I hit some issues as there are two pubsubclient libraries with different versions and slightly different API's. Keep an eye on github. Scott, this is awesome! Once your custom firmware is loaded, is the device still accessible by the ios apps (ECO Plugs / WiOn)? The new softawre leaves the legacy software behind; if further analysis of the protocol is added I wouldn't be opposed to adding in support. There is some multicast discovery happening which I havn't looked into. I've mirrored Scott's work on the EcoPlug and retrieved a dump of the serial console output with the default firmware. Posting here for anyone interested. XXXYYYZZZ is the SSID of the wifi network the EcoPlug was configured to connect to. My unit *does* have the power monitoring hardware which is depopulated in Scott's hardware. I'm in process if trying to figure out how it is connected to the ESP8266 so power usage details can be included in Scott's firmware. Does anyone know how to extract a hex from an ESP8266 that is able to be re-loaded later? Ie, is there a way I can save the default firmware? [Flash]SN SLqrXGZsiM Read Flash 3 Sector0+1024+512 Successful ! [Flash]Factory Infor IP: 203.66.65.34 SSID:ECO-Plugs Wifi_Main_Name:ECO- Read Flash 3 Sector0+1024+512+128 Successful ! On the ESP unit, the pin about GPIO13 is GPIO12. The pin about that is GPIO14. So, reading down the left side of the ESP unit in the picture, the pin order is GND, VCC, RESET, unknown, GPIO14, GPIO12, GPIO13, GPIO15, GPIO2. In my tests, writing HIGH to GPIOs 7, 8, 9, or 11 (and possibly more) cause the unit to either sleep, crash, or reset - still investigating this. I have not been able to determine anything about the current monitoring hardware and how it is connected to the ESP uC. Oops, in last comment "about" should be "above" in first and second sentence. 15$ price that you mentioned. Do you mean 15$ for each outlet ? or 15$ for the box ( which contains 2 outlets ) ?. What are the three wires going from the power board to the digital board? @Vladimir: Looks like it would be DC. If you look at the pinout diagram, you can see that that two of the wires trace back to the regulator located at the bottom right of the board. So possibly 5v or 12v DC, regulated down to probably 3v3 for the ESP8266. I was looking into the current sense; U2 appears to have the lable 1588NAZ04 on the bottom. Haven't found anything that tells what it is. Pin 5 is connected to GPIO0 for what seems like a clock and Pin6 goes through a resister as a input into GPIO12. Almost seems like a I2C device. Anyone else have a clue? 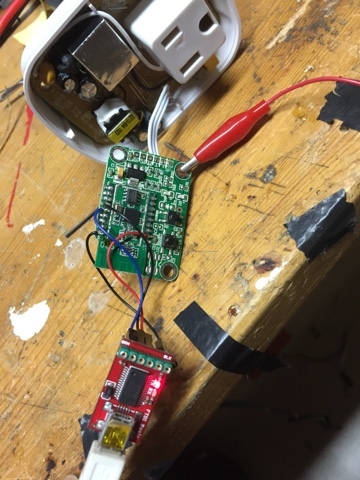 The 1588NAZ04 U2 (ESP8266 board) is connected to U1 (HLW8012 on the power board). It seems to take the 3 pulse signals from the HLW8012 and turns them into some kind of Manchester encoded data stream (clock + data) that the ESP8266 reads on GPIO12. This makes the design more complex since it would have been just as easy to use the ESP8266 to count pulses rather than involving another IC. My investigation continues - will work on some code to capture the data coming to the ESP8266 and see if it makes any sense. Just an update; does not appear to be Manchester encoded data, but clocked out via GPIO0 to GPIO12. The factory software clocks this data out at an inconsistent rate that made it look like Manchester encoding. Still might be I2C, but not quite sure. If only someone could find a manual for that chip or attach a bus pirate. I picked up 3 boxes of these on clearance at Home Depot in Halifax for $25.98 apiece. Each box has two units in giving a unit price of $13 (I think this may be where some of the pricing confusion is coming from). Home Depot appear to be dumping them as they are no longer listed on their web site and other stores in the area don't have them. 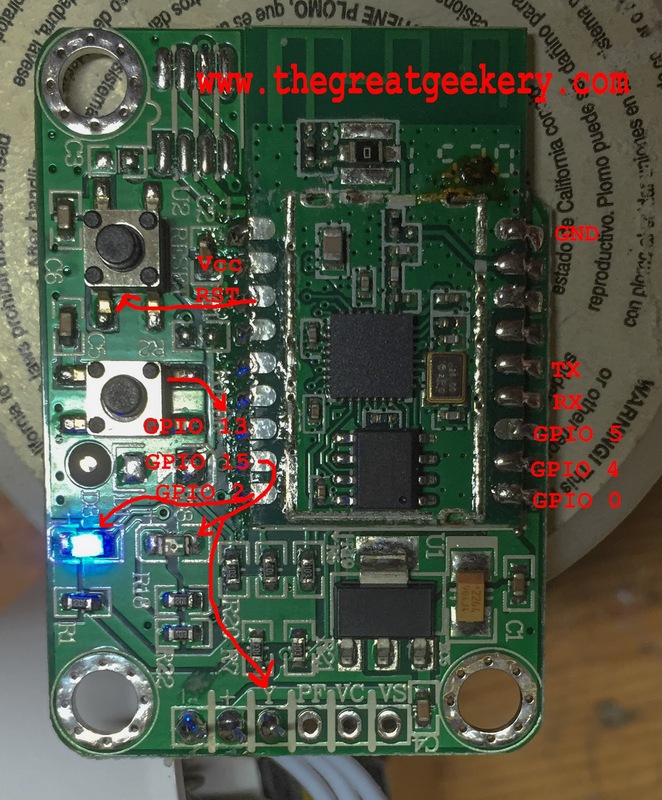 One other gotcha that may help people - to flash the rom tack solder gpio0 to ground and power cycle, there will be no response from the unit (not even a LED flash) but it is ready to receive a flash at 115200. HLW8012 is a dummy power meter. CF1 and CF output is dyanmic frequency with 50% duty cycle. this means, you need to check the freq on CF1 and CF2 to know V and I consumption. the chinese datasheet shown on how to do "freq" calcuation..
you need to detect freq on CF and CF1. the range should be 0-1KHz that depends on crystal Freq and Vref. Very interested in this project. Can you comment; how is the stock firmware/app working through firewalls? I assume it must be doing some sort of long polling to the eco plugs server? What is the mechanism? I would be interested in having a copy of the stock firmware so that I could revert if needed. I am also interested in figuring out how the units read the power load. I was able to get my logic analyzer connected to one. I see what looks like a clock on GPIO0 and data on GPIO 12. From the clock I see four 8 bit cycles followed by three 32 bit cycles. The eight bit cycles seem to be a header in that they are the same. The three 32 bit numbers are changing. I would assume they correspond to the voltage and current numbers output on the serial interface. I wrote a script to monitor the output on pins GPIO0 and GPIO12. I get a 128bit output in 5 second intervals but I have not been able to find anything that relates to voltage, current, and wattage. Here is my code. I used pins 4 and 5 from a second arduino board. There is some unknown IC connected to the power monitoring chip that appears to convert the pulses from the power monitor chip everyone has already idenfied into I2C device on Pin 12 for data and Pin 0 for clock. You can then read 16 bytes from it on a regular basis. The first 4 bytes (unsigned long low byte first) appear to count the current or power not sure which. Everytime you read from that chip, the count is reset, so the speed the data is read from it is important part of the calculation used. I setup mine to read every 10 seconds and use a formula that I came up with by testing with several loads. Different timings require adjusting the formula. I have noticed that occationally, the count doesn't get reset. It may be necessary for your application to keep a running average and/or ignore data that represents a sudden change for several readings. Here's just a quick code fragment to demo this below. This code is partially extracted from a much larger custom home automation system that I've built. Data structures have been simplified here. Hope you guys find this useful. With further testing, it should be possible to identify the other 3 long values. There should be current, voltage, and power at least given what my test probes of the connections between the mystery chip and the HLW8012. Correction: It is High byte first. Apparently the mystery chip is a micro-controller but I don't know which one. I also have a copy of what I believe is the original firmware but not sure. Scott, I can't imagine that the original firmware is of much use unless someone wants to return the thing to factory default. I think we can agree is not that desirable as I believe people have already identified that your SSID and password are sent in clear text to some server in China. I also think disassembling the ESP8266 code would be a nightmare. With all the efforts everyone has put in, we can flash the ESP8266, control the relay, and read the button. Now with the I2C code, we can at least get a estimated watts being used. Just a matter of more experimentation to map the other values to current and voltage readings. Someone with a better electronics workbench and gear than I have might be able to do that - since I was just using a fan, some lights, and a toaster as load sources and a meter to measure current. I suppose it might be interesting to integrate this into the github code to make it all plug and play. Might be a route for getting fresh firmware on the devices without cracking them open, and all the more reason to write open source firmware for these. Does anyone know any power switch with esp8266 for the european market? A hearty thanks. I originally found the instructable for this project and migrated over here for more help. After originally trying with an arduino uno, voltage divider etc I finally caved and found a ttl adapter locally yesterday. Got the original firmware out and stock esp firmware in last night and played around with AT commands for a while before quitting. After dealing with some library issues, and remembering which button to hold and which to release got your firmware installed. FYI Home depot's web page is listing these again, possibly for the holidays. Watch for them again after Christmas. Now to try to figure out openhab and getting this connected there. Sorry forgot to post Home depot link. Excellent project! I found one of these switch at Wal Mart called the Eco WiFi switch and quickly came across your code here. Had some issue with the Arduino IDE with esp8266 board - using Generic ESP8266 Module and the default flash size of 512k kept getting a fatal error (28) - then stumbled on setting that to 1M (512k SPIFFS) and then it all works - also had to change ON = 1 and OFF = 0 to work right, but it's talking thru my mqtt server now. in handle_on() and handle_off() otherwise the browser or wget would just spin waiting for a reply (and the browser would keep requesting the page which would override anything injected via mqtt!). Has anyone tried the current measurement code? I'm having a few issues. It seems to "sort of" work. I get values out of it, those values are close to zero when no current is being drawn, and nonzero when something is plugged in. But other than that, the values don't seem to reflect any consistent measurements. I'm measuring every 10 seconds (like the sample code) so I would expect to get values around 100. Typical values I see are around 54, or around 475. Values in those ranges are typical, but I've seen other values too. search for "workchoice indoor switch" on walmart.com, 18$ each, and have the voltage reading chips in them. Super excited by this! Found a ton at a REStore: habitat for humanity near me, cheap. I was trying to use a 3.3v micro controller (spark core, also a particle photon, the more recent version) as a serial bridge between the ESP and my laptop. (The Spark Core has a hardware UART) and everytime I hooked up the serial pins the ESP would turn off its lights - same behaviour as if the serial pins were shorted to each other on the ESP. 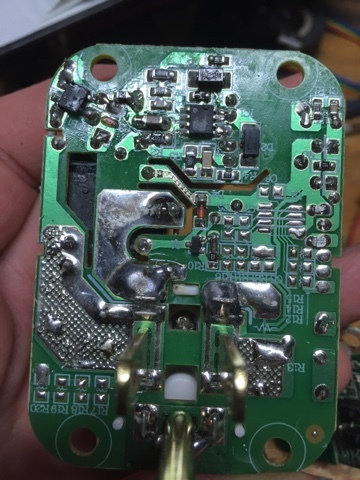 Removing the serial connection (also unshorting the TX/RX) and the ESP would apparently reboot. Any thoughts? I'm also going to try to make a jig so I can do this without soldering (although I'm not sure how I'd ensure contact). Went back to my Spark Core after reading the difference between .write and .print and it worked first try. Now on to the fun stuff, thanks for this. Home Depot in the states (well in PA and OH at least) has the single outlet for $7.77 USD. It is the Ct-065w and the bar code is 82721 406057. Eco # 1001 763 273. Can someone point me to a description of how to dump the existing code? I'm running a bunch of these and concerned about the hackability. But all of this is Greek to me. Is there any easy way for me to make these more secure without opening up the device? Thanks! I'm using an FTD1232 and I can connect to the Eco plug using Putty but all I get is the following data in the terminal window, over and over and over. How do I get this thing to accept AT commands? The stock firmware is designed to talk with some server in China and the phone application talks to the same server and provides your Wifi password information so it can get onto your network. I believe many people have looked at this communication and found it was pretty insecure, plus some unknown entity now has a copy of your WIFI SSID and password. Stock firmware doesn't really have any interface (network or serial) that lets you do anything useful with it. It won't accept AT commands. To be able to not only get a much more secure product, you have to replace the firmware. 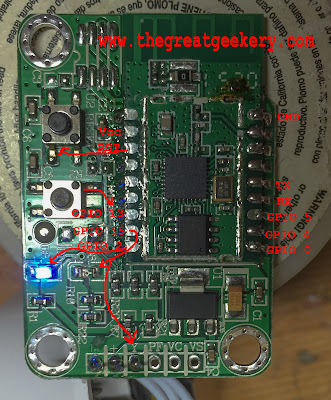 The only way to do that is to open it up, connect up serial lines, reset, and GIPO0 and flash it just like any other ESP8266. Basically following this article as a guide. No real shortcuts here I'm afraid. Takes about 30 minutes per module once you do it a few times. Has anyone gotten MQTT and remote control of the switch working with the homie firmware? I was able to set it up with homie and it is connecting to my WiFi but I can't seem to control the switch. Should I be seeing MQTT updates when I press the button? I have it working; look at this example (https://github.com/marvinroger/homie-esp8266/tree/develop/examples/IteadSonoffButton) it will work once you modify the pin definitions. Scott, I plan to clean this up a bit and submit a pull request When Time Permits. Thank you. I updated the pin assignments for the button, LED, and relay this morning using Scott's code and I began getting MQTT updates. I wasn't able to get the state to change in response to a publish though. Should that functionality be working? I'll give your fork a try once I get home this evening. Thanks Randy! When I published to /set the plug responded. I appreciate your help. Is there a topic I can publish to that will return the current switch status? Michael: to the best of my knowledge, you can only check the status by subscribing. I believe that Homie defaults to using retained messages by default, so the current state will be sent when you subscribe (without retained messages, you only receive messages when the state changes). has there been any further progress on decoding the power data? Check https://bitbucket.org/xoseperez/espurna. 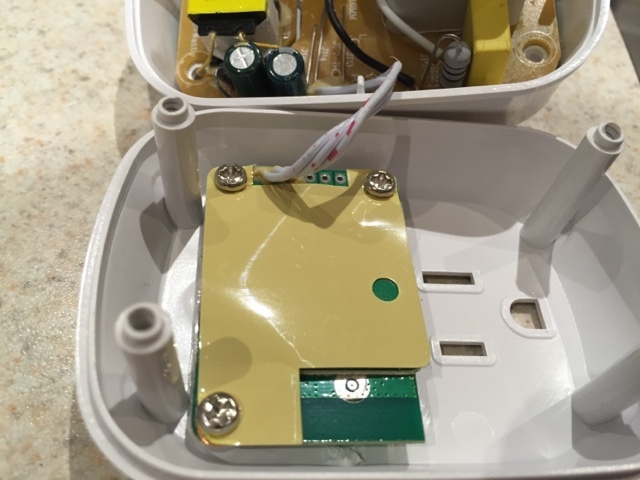 There is support for this device (called ecoPlug in the firmware) and support for some power monitoring chips in the Sonoff devices - so if your WiON / ecoPlug device has the power monitoring chip, you might be able to add in the code from this firmware to support it. the power monitoring chip in the itead sonoff pow is the same chip as in these devices, but it's connected up directly to the esp8266 where I understand that on these systems there is some other intermediate chip. Did two of these and run with home assistant-works great. is the same hardware inside? Has anyone tried to flash these devices with software that supports OTA (Over The Air) updates with ArduinoOTA? OTA is very cool, and I use it with most of my esp8266 based devices. Once the initial software is installed, you can send updates directly to the device without having to remove it from it's installed location and carry it to a computer for programming. I've used it with a number of different devices, including re-flashed devices with embedded esp8266's like the Sonoff switches. But for some reason, I can't get it to work on these ecoplug/workchoice devices. OTA working on ecoPlug for me using the espurna firmware. the tasmota firmeware supports ota upgrades. I don't think it uses the ArduinoOTA library, when the subject came up IIRC the discussion as that that particular library would add significantly to the image size, pushing it over the limit to be able to be upgraded. Very excellent blog. I read this have fruitful content and helpful for me. Thanks for publishing this blog. Does anyone know if the ecoplug esp8266 has an adc/tout? I need to use one with a thermistor but can not find any data about the tout/adc. Realy aosam tips thank you your writing is very very amazing..
useful info. Thanks for sharing. Great info.. Thanks for sharing.